As the Syrian Arab Army and Syrian government make more significant advances in restoring security to northern Syria’s Aleppo and its population, war-propagandizing human rights groups posing as neutral, and Western media (and Gulf counterparts like Al Jazeera) churn out recycled and debunked accusations anew. According to these compromised US government and Soros-funded NGOs and much of the corporate media, there is only one “last” pediatrician and a scarce number of doctors left in Aleppo. They are, of course, referring solely to the terrorist-occupied regions of Aleppo (eastern and some northern quarters) and even then ignore the reality that the Syrian government continues to pay the salaries of doctors in terrorist-occupied areas, including eastern Aleppo. The presence of terrorists (Jabhat al-Nusra, and what the west calls “moderates” — Ahrar al-Sham, Jaysh al-Fateh, Nour al-Din al-Zenki, and factions of the so-called Free Syrian Army) in eastern and northern Aleppo. The presence of over 1.5 million civilians in the government-secured areas of western Aleppo, who are murdered and maimed daily by terrorist-fired, US/Turkish-made rockets, missiles, mortars and ammunition, as well as explosive bullets, and locally-produced explosive-stuffed gas canisters and mortars. The presence in government-secured Aleppo of civilians from terrorist-occupied areas of Aleppo — many of whom as early as 2012 fled the influx of terrorists to their districts, others who over the years since have fled west, and a small number of whom have recently been able to flee via humanitarian corridors to safety in western Aleppo. The presence of not just one, but over 4,100 doctors (source: Aleppo Medical Association) and numerous functioning hospitals in Aleppo — in spite of the criminal western sanctions on Syria and in spite of hospitals having been targeted by terrorists’ bombings. In the first week of July 2016 I traveled by car to Aleppo. When entering the southern Ramouseh district of the city, the car sped along a road known for terrorist snipers. Three weeks later in Ramouseh, a woman was sniped by a terrorist and killed. In Aleppo, I met with doctors from the Aleppo Medical Association (established in 1959), including Dr. Zahar Buttal, Dr. Tony Sayegh, and Dr. Nabil Antaki. One question I posed to the doctors was regarding the other oft-repeated lie of the “last pediatrician” in Aleppo, a startling allegation designed to shock western readers and rally them against the Syrian government. And one which has no basis in truth. Indeed, the Quds hospital referenced was central to the April/May frenzy of media lies regarding Aleppo and the Syrian government, and Russian allies. Claims around the building called al-Quds hospital contradicted one another, the fallacies and serious discrepancies outlined in this article. 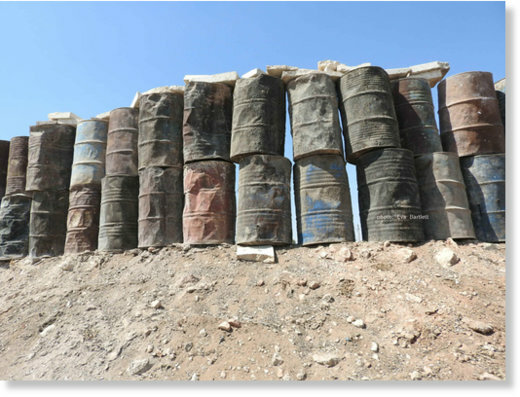 Also central to the lies were the bias and propaganda of the very partial, corporate-financed Medecins Sans Frontiers (MSF), which supports areas in Syria controlled by terrorists, specifically Jabhat al-Nusra (whose failed attempt at re-branding with a new name – Jabhat Fatha al-Sham – does not negate its ties to Al-Qaeda nor erase their crimes). Yet, according to Dr. Zahar Buttal, until now there are 4,160 doctorsregistered and active in Aleppo city, in the government-secured areas of over 1.5 million people. Of the 4,160 doctors, 200 have been newlyregistered since the beginning of this year. 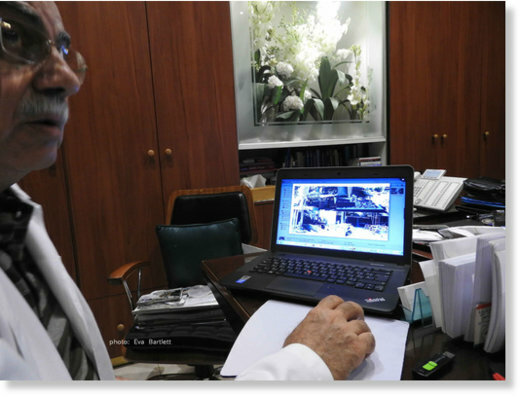 Dr. Nabil Antaki, himself a gastroenterologist, is one of a group of 15 specialist doctors which, since late 2012, have volunteered their services, treating in private hospitals (with the most minimal equipment and medical fees possible) upwards of 500 civilians severely injured by terrorist bombings, needing specialist care and often life-support. Specialists in his group alone include: three general surgeons, one heart surgeon, one neurosurgeon, two orthopedic surgeons, and three anesthesiologists. Dr. Antaki has been outspoken about the western media lies on Aleppo. When the western-created “Aleppo is Burning” campaign took flight in late April – the exact time when western-backed terrorists increased their daily bombing of Aleppo to severe bombardments – Dr. Antaki, seeing the worst of the casualties and bombings, spoke out. When I met him in July 2016, Dr. Antaki continued to be vocal about the media manipulations and fragrant lies about the reality on the ground in Aleppo. This hospital, in the Sukkari district, they made a big propaganda about it, ‘the last doctor in that area,’ which is absolutely wrong. The government has doctors working in that area who get theirsalaries from the government, even though the area is controlled by terrorists. For the government, all areas and and their inhabitants are Syrians. Areas where there are terrorists, like al-Manbij, like al-Bab, in all those areas there are many doctors working with the health ministry, and they take their salaries from the health ministry. Dr. Nabil Antaki gave the following overview of life for the civilians of government-secured Aleppo, from mid-2012 until our July meeting. Since July 2012, the main area of Aleppo receives every day mortars, bombs and gas canisters, sent by the ‘rebels’ on the civilians living in Aleppo. Here you have human damage more than there, but less physical destruction, because here we are receiving mortars and gas canister bombs. If a mortar hits the building, it might make a hole the size of a window, but also kill five people at once. In the part of Aleppo under the government control, every day we have dozens of injured and killed. 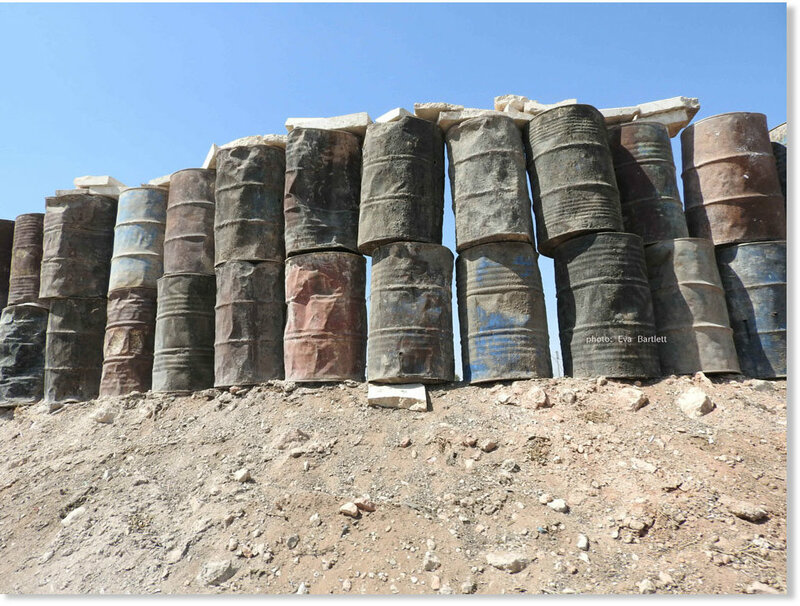 In late April 2016, terrorists in the occupied eastern quarters of Aleppo, as well as then-occupied Beni Zaid and neighbouring districts, increased their normal bombing campaigns of mortars, gas canister explosives (from household to the the largest size canisters, stuffed with glass, bearings, metal shrapnel), explosive bullets, and powerful foreign-supplied rockets to from high-tens to over one hundred per day on the heavily-populated areas of Aleppo secured by the Syrian state. Usually you don’t have just one mortar, you have a rain of mortars: ten, twenty, thirty, and more in a few hours. Many people are wounded at the same time. When ambulances bring people to the public hospital, maybe twenty or thirty people arrive at the same time. The public hospitals lack enough medical staff and equipment. So if you have ten severely wounded persons arriving at the same time at the public hospital, by the time care comes, a victim has time to die. April 23rd: 81 martyrs, 30 wounded. April 28th & 29th: Bloodiest days. 31 martyrs, 75 wounded **initial numbers only. From April 23rd-30th: 120 martyrs, over 800 wounded. 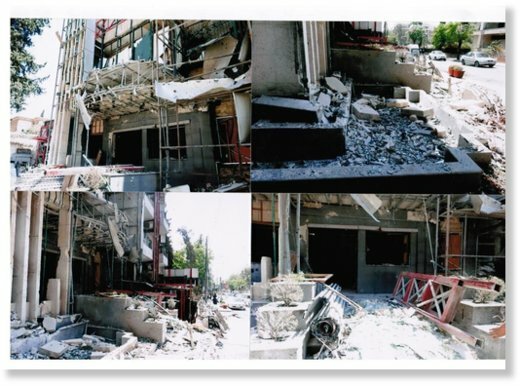 May 3rd: 25 martyrs, 100 wounded (including 3 women killed in the al-Dabeet maternity hospital explosion). Although the Aleppo Medical Association documented the daily number of killed and injured by this increased bombing campaign, and although the areas attacked included a number ofregistered Aleppo hospitals, corporate media and Wall Street-backed “human rights groups” in their Turkish-based, or further-removed, reporting on Aleppo preferred to cite “unnamed activists” and al-Qaeda-in-Syria “White Helmets” actors. Like many (if not most) Alepporesidents , Dr. Zaher Buttal has never heard of the White Helmets. The fact that the head of the Medical Association is not aware of this group purporting to be rescuing civilians in Aleppo highlights the reality that they work solely in terrorist-occupied areas and for the terrorists themselves. For more information on the terrorist-propaganda group that is known as the “White Helmets,” see this video and this article. The same July 2016 Intercept article which promoted the lone-doctor narrative also neglected to mention that a hospital they cite is in fact a hospital not only long-established but also belonging to a volunteer association headed by Syria’s Grand Mufti, Dr. Ahmad Badr Al-Din Hassoun. 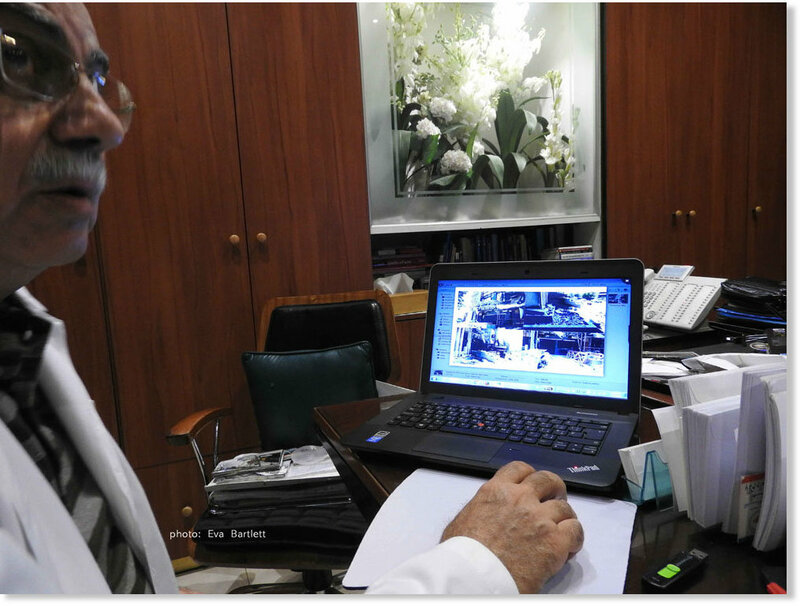 In a mid-July and then an August 11th meeting with Mufti Hassoun in Damascus, he explained that the organization (The Association of Raising the Standard of Health and Social Status) of which he is Director had two hospitals and ten clinics daily giving medical care for free to up to 1500 of Aleppo’s poorest. One of these hospitals was the mentioned Omar Ibn Abdul Aziz hospital. It had three operating rooms, an MRI, nine dialysis machines, 12 incubators, and 50 beds. It is now controlled by terrorists who, Mufit Hassoun said, further mounted machine guns on the hospital’s three ambulances. The humanitarianism of western-backed so-called “moderate” “rebels”. In 1985 we started construction of the hospital, and in 1992 the hospital started operating. We treated for free over 400 patients daily, people from a very poor neighbourhood. When the terrorists took over the hospital, they evicted the doctors, and killed three of the nurses and more than ten of the patients. The media say that MSF is supporting the hospital, but they are using it like a field hospital to treat terrorists. This is the hospital that we built with our own hands, and now they lie and say that it’s their own hospital. Halfway through a video which the Intercept piece links to, who should appear but the war-propagandizing White Helmets – who only work in terrorist-occupied areas. This is the evidence the Intercept presents, along with a UN report lacking sources for its assertions. The UN has no physical presence in terrorist-occupied eastern Aleppo and, like lying media and NGOs, relies on “unnamed activists” and the SOHR-type sources for their statistics. There are now in the eastern part of the city of ‪#‎Aleppo, no fewer than 300 thousand people, there are only 30 doctors in five hospitals to serve them. The photo in question was in fact from a May 6th protest (photos here) organized by the Aleppo Medical Association outside of the destroyed al-Dabeet maternity hospital, gutted on May 3rd by a terrorist rocket. According to Dr. Zaher Buttal, more than 150 doctors attended the demonstration. The protest came following the weeks of carnage from terrorists’ relentless bombardment of civilian areas all over government-secured Aleppo – including numerous hospitals – and was, Dr. Buttal said, both in anger at the terrorists’ targeting of hospitals in Aleppo and also to show the world that, contrary to media lies, Aleppo does have doctors. Their signs – in English, Italian and German as well as Arabic – read: ‘Syrian Arab Army represents me’, ‘Long live Syria, long live Aleppo’, ‘Terrorists are killing our children’, ‘Armed opposition is destroying our civilisation’, ‘No for armed opposition’. 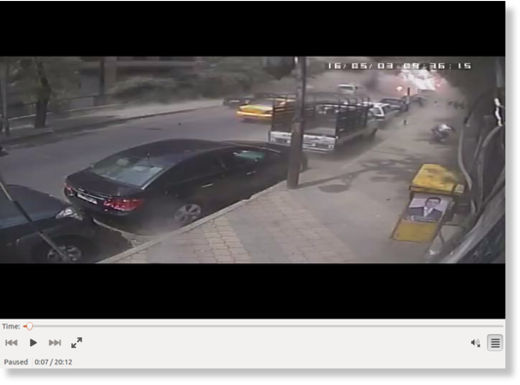 From the terrorists’ May 3rd bombings, a rocket landed on a parked car right next to the al-Dabeet maternity hospital, causing a massive explosion which gutted the hospital interior, severely damaged the exterior, and burned the two cars parked behind it. 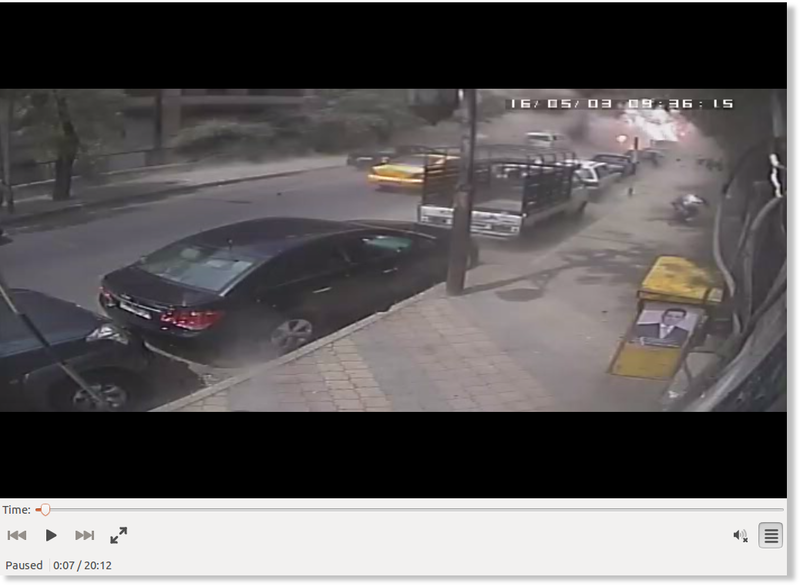 Footage from a nearby building’s security camera shows the rocket and subsequent massive explosion occurred at 9:36 am, May 3rd. While initial reports said 16 civilians were killed in the May 3rd terrorist bombings, by the time the wounded had succumbed to their severe injuries, 25 people were killed and over 100 injured, according to the medical association’s Dr. Zaher Buttal. The three women killed were in the al-Dabeet hospital reception at the time, said Dr. Dabeet. One of the injured included a 28-week-pregnant woman who survived the loss of long sections of her intestine due to shrapnel injuries. The operating room was destroyed, along with patient rooms, five of ten incubators (the other five needing repair), and much of his equipment. One week later the maternity hospital was again hit by a terrorist-fired mortar, destroying the roof and injuring construction workers there, according to Dr. Dabeet. 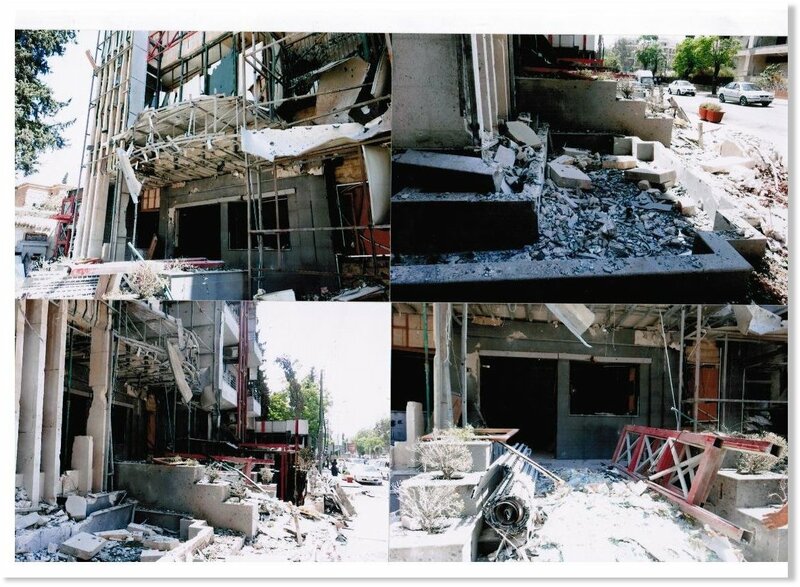 Dabeet Maternity hospital after it suffered a direct hit from Western-backed terrorists in Aleppo. According to Dr. Zaher Buttal, other hospitals hit include the Ibn Rashd hospital, with a mortar hitting the top floor, the Arab Medicine hospital, and the perimeter of the Razi hospital. While terrorists’ bombings and sniping attacks have been the most pressing issues in Aleppo in the past few months, other crises since 2012 have been those of water and electricity shortages, as well as the terrorist-blockades suffered by the population in government-secured Aleppo, cutting off food, fuel and medicine to the city. The already risky Ramouseh road which I took into Aleppo in early July was recently assaulted by terrorist snipers and shelling, and has been closed to prevent civilian fatalities. This sole road leading into Aleppo closed, terrorist actions have again cut the lifeline for the over 1.5 million people inside. In July, Dr. Nabil Antaki explained how terrorists themselves closed the road many times in the past, and the dire effects of doing so. Because the ‘rebels’ control the main roads around Aleppo, Aleppo has suffered blockades, sometimes for a few days and other times for many, many weeks. During those many weeks, nothing was able to enter Aleppo: no food, no vegetables, no fruits, no gas, no medical equipment, no drugs… the people of Aleppo suffered a lot. The water supply has been cut by ‘rebels’, because the main water stations are in ‘rebel’ areas. Many times they cut the water for weeks or months. So for three years, we had to use the water of wells — we now have in Aleppo 300 wells which we had to use to provide water for the 1.5 million persons living in Aleppo under the Syrian state. In addition, we don’t have power supply, because the electricity generator and power supply are in the ‘rebel’ portion of Aleppo, and they cut the supply. That’s why people have private subscription to 1 or 2 amperes, just to have 1 or 2 or 3 bulbs during the night. They have to pay very expensive prices just to have this. The people of Aleppo are truly suffering. Our water reservoirs are 90 kilometers [56 miles] away, in Hafsa, a region held by IS [Islamic State]. In May, they cut the amount of water [supplied] by half…. The second aspect of the problem is distribution. The water pumped by IS flows to the Suleiman Halabi and Bab al-Nairab stations here [in Aleppo]. Both areas are controlled by Jabhat al-Nusra, and they are using the water as a weapon to impose their demands. The power plants are outside the city. Terrorists control two areas from where electricity lines to Aleppo pass. Whenever they want to put pressure on Aleppo, they cut the electricity. And when electricity is gone, the water supply is cut off as well. Corporate media have largely ignored these very real crises, and instead manufacture (regarding terrorist-held eastern Aleppo) the same types of propaganda campaigns of “starving civilians” which earlier flooded social media and were endorsed by dubious NGOs, like those on Madaya and Yarmouk. In all cases, no mention is made of the fact that the population in the area includes terrorist factions or why there is any lack of supplies (because of the terrorist factions). As with Madaya and Yarmouk, whenresidents of the terrorist-inhabited regions do manage to speak to media, inevitablythey speak of terrorists stealing food supplies, hoarding goods and selling them at extortionist rates, and preventing residents from leaving to safer areas. On July 28, the Syrian Arab Army fully secured the Bani Zaid and Lairamoun northern neighbourhoods of Aleppo city,liberating them from the western-backed mercenaries who occupied the districts since October 2012. Civilians who had remained in Bani Zaid spoke of the terrorists’ firing of gas canister and other bombs on the civilians of neighbouring government-secured Aleppo districts. Western corporate media largely ignored this significant liberation and the jubilation of liberatedresidents . On the same day, President al-Assad issued a decree granting amnesty to Syrians who laid down their weapons and reconciled with the state. When the Syrian-Russian coordinated humanitarian corridors opened in eastern Aleppo in late July, reports soon after emerged of terrorists preventing residents from leaving, including assassinating residents who attempted to leave. When some residents from these areas did manage to evacuate, testimonies showed them thanking the government for providing the basics and cursing the terrorists for having stolen from them, abused residents, and in many cases killed their loved ones. Russia Today interviewed evacuees who likewise did not praise the west’s so-called “rebels” but spoke of the hell civilians endured under terrorist occupation. “We left with our remaining children. May God punish the rebels. They did not allow us to leave, they deprived us of gas, water, electricity and bread. We were not allowed to leave. There were no medicines. They used to tell us you live with us or die with us,” one woman said. “For three days after the liberation of Bani Zaid, it was very quiet in Aleppo. People were happy, there were no more mortars. Suddenly, yesterday, the terrorists started sending mortars and rockets on Aleppo again, especially on Hamdaniya where thousands of displaced people live. So people are leaving this neighbourhood to find another place,” Dr. Nabil Antaki told me on August 1st . In a phone call on August 10th, Dr. Zaher Buttal updated that since July 30th, terrorist bombings had killed 30 civilians in Aleppo, and wounded hundreds. By August 11th , Dr. Buttal said another 16 civilians in Hamadaniya, Aleppo, had been killed by terrorists’ missiles, another 45 wounded. Today there was supposed to be a truce between 10 am and 1 pm. Terrorists ignored this and again bombarded Hamadaniya neighbourhood. Both Dr. Buttal and truth-based media have reported that terrorists used toxic gas in their bombardment of civilian areas of Aleppo. The Western corporate media and NGO complex, on the other hand, continue to talk about imaginary “last doctors” in Aleppo, while ignoring the very real suffering of over 1.5 million Syrians in government-secured Aleppo, as well as the doctors who are treating them. 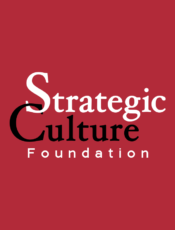 This is hardly surprising given that, from the very beginning, the corporate media has toed the NATO agenda on Syria, which is to manufacture every imaginable lie and accusation against the Syrian government, the Syrian Arab Army, and the people themselves, in order to chase the NATO-GCC-Zionist-Turkish dream of imposing a puppet government in Syria. They have failed. Eva Bartlett is a freelance journalist and rights activist with extensive experience in the Gaza Strip, where she lived a cumulative three years (from late 2008 to early 2013), arriving by boat as a part of the Free Gaza missions. She documented the 2008/9 and 2012 Israeli war crimes and attacks on Gaza while riding in ambulances and reporting from hospitals. Eva accompanied Palestinian fishers and farmers as they came under intensive fire from the Israeli army. She has been to Syria four times since April 2014 and works to convey the voices of a people suffering under the foreign war on Syria. Her writings can be found on her blog, In Gaza.